A team of scientists at the University of Texas Medical Branch at Galveston recently investigated a new way to treat multiple forms of dementia, such as Alzheimer’s and chronic traumatic encephalopathy. 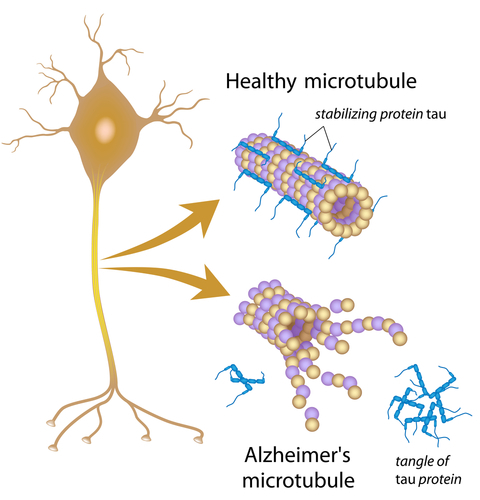 Inside the brain cells of dementia patients, “tau protein,” which is normally involved in microtuble formation to allow transport of nutrients and waste throughout the cell, accumulates and interferes with cell-to-cell communications. When neurons lose their contacts with other neurons, they become dysfunctional and can apoptose. If enough cell death occurs, patients suffer from cognitive impairment. Removing tau protein from brain cells is not a viable option to treat dementia, as neurons also become dysfunctional in the absence of tau. Instead, the UTMB researchers investigated the potential of removing toxic tau accumulations (tau oligomers) to improve performance of rats during memory tests. Treatment involved administering a single dose of a novel tau oligomer-specific monoclonal antibody (TOMA) to rats with tauopathy (tau-related dementia). As reported in The Journal of Neuroscience, results showed that just one injection of TOMA was sufficient to reverse locomotor and memory deficits in the mice for 60 days as a result of a rapid reduction in tau oligomers. Toxic tau was exported from the cell and cleared from the periphery, but monomeric tau was left in-tact, allowing brain cells to recover. “This is significant because this research describes a very promising vaccination strategy for Alzheimer’s disease, which could prevent memory loss from occurring later in life,” said Rakez Kayed, senior author and professor of neurology at UTMB. “No safety concerns were detected in mice receiving this treatment, but more research is needed to confirm the efficacy and safety of immunization in other animals and in humans.” Previous testing from the same team showed that TOMA was effective in halting the spread of toxic tau oligomers; these results were published in the Journal of Alzheimer’s Disease. Explained Diana Castillo-Carranza, a postdoctoral scientist in Kayed’s laboratory and lead author of both studies, “New evidence suggests that in Alzheimer’s disease the pathology is spread through the brain from one area to another by oligomeric tau. Here we are showing that TOMA antibody has the ability to protect the brain from tau toxic aggregates.” Perhaps someday passive immunization with TOMA will be used as a complement to Aβ immunotherapy to treat Alzheimer’s disease.